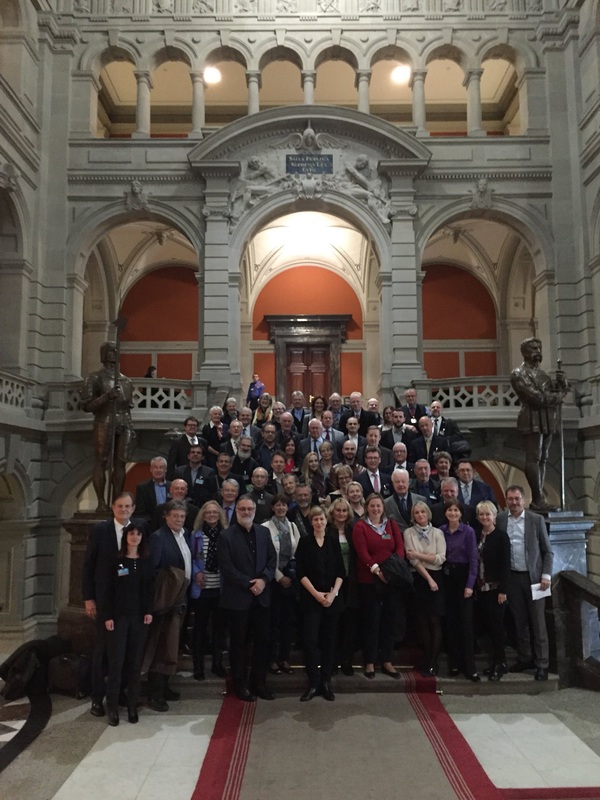 The legislative body of the Organisation of the Swiss Abroad (OSA), the Council of the Swiss Abroad (CSA), met for its biennial meeting at the town hall in Bern on 10 March 2018. 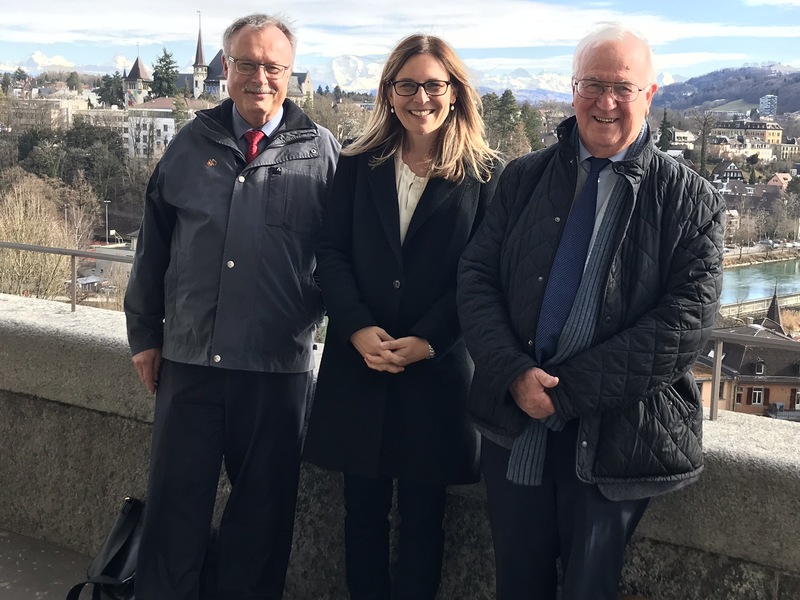 The meeting followed on an informal exchange with Swiss parliamentarians on Thursday afternoon where a first update on the political issues with relevance for the Swiss Abroad was given. The CSA meeting on Saturday was chaired by OSA President Remo Gysin. Attending members of the Federal Parliament were Filippo Lombardi CVP/TI (OSA Vice-President), Laurent Wehrli FDP/VD (OSA board member) Carlo Sommaruga SP/GE (OSA board member), Roland Buechel (SVP/SG), and Tim Guldimann (SP/ZH). 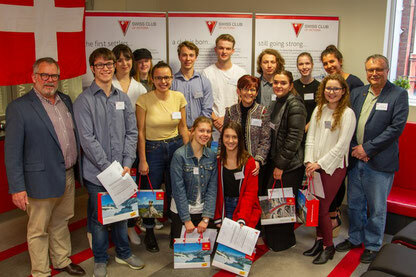 Delegates attending from Australia were Beat Knoblauch (Sydney), Roland Isler (Melbourne) and Carmen Trochsler (Adelaide). 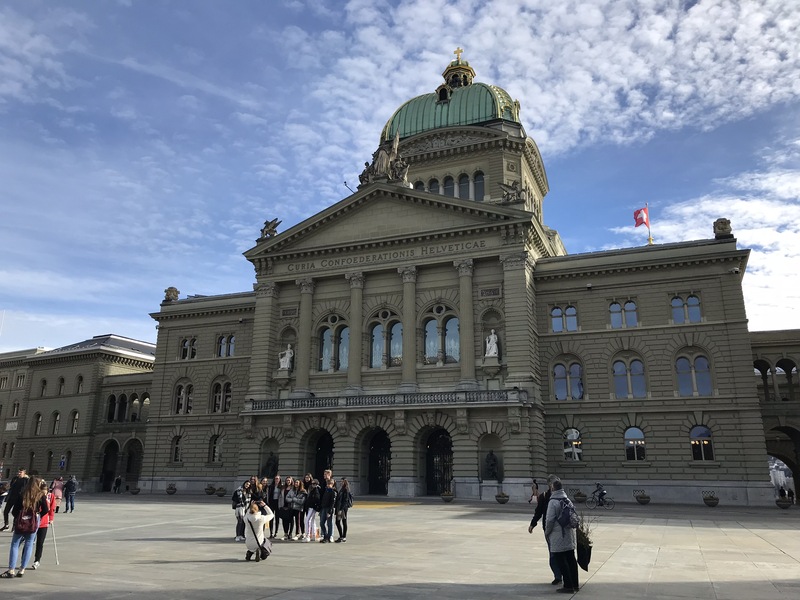 Amongst the political issues discussed were the unexpected parliamentary proposal to limit welfare benefits, the ongoing difficulties to maintain a Swiss bank account and the delay with the introduction of e-voting. 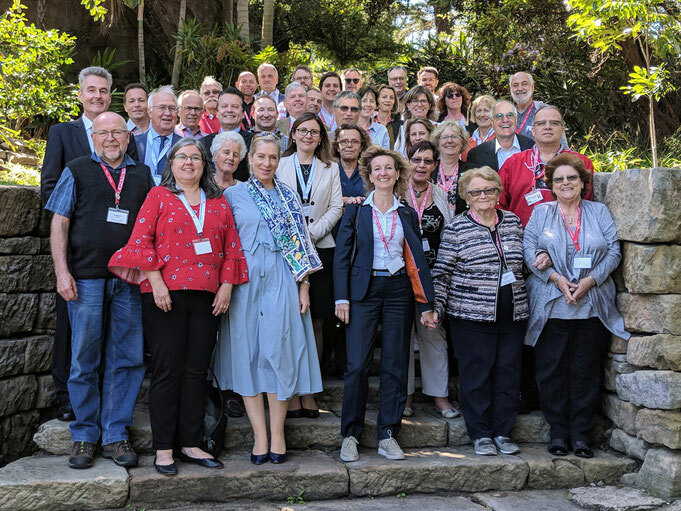 Further agenda items related to procedures and finances of the Organisation of the Swiss abroad and measures to improve communication and representation of the OSA (Summary of meeting see below). 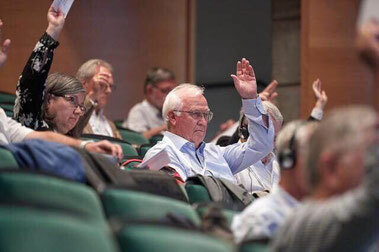 An agenda item only added a week prior to the meeting was the proposal of a committee of the House of Representatives linking welfare benefits (Ergänzungsleistungen) to 10 years uninterrupted residence status in Switzerland prior to asking for benefits. ‘Ergänzungsleistungen’ are benefits paid to Swiss residents in addition to the AHV if the latter (and other income) is not sufficient to guarantee a minimum income. The proposal potentially affects all Swiss in pension age returning to Switzerland from a short or long stay abroad. In an unanimously adopted resolution the assembly called on parliament to reject the proposal. 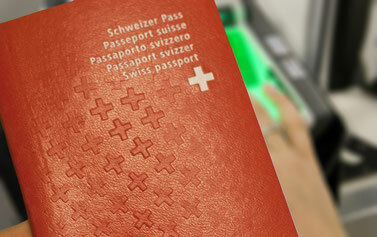 According to the Council the proposal is not only a breach of legal equality set down in the constitution but also contradicts the increasing international mobility of Swiss citizens. It was also noted that the proposal is not at all in the interest of the Swiss economy, notably the export-oriented sector and companies with subsidiaries abroad. There was some urgency to the resolution as the House of Representatives was due to discuss this proposal the following week. Comment: The house of representatives adopted the proposal of the committee with slight changes on 15 March: In their version, the payment of welfare benefits would not require 10 years uninterrupted residency prior to the request for ‘Ergänzungsleistungen’. Required are however 10 years of AHV payments in total. Since a change needs the approval of both chambers the proposal will be discussed by the Council of the States in one of the next parliamentary sessions. The OSA board announced that the Geneva Cantonal Bank agreed to offer bank accounts to all Swiss expatriates who comply with international regulations. The Geneva Cantonal Bank has branches not only in the canton of Geneva but also in Zurich. 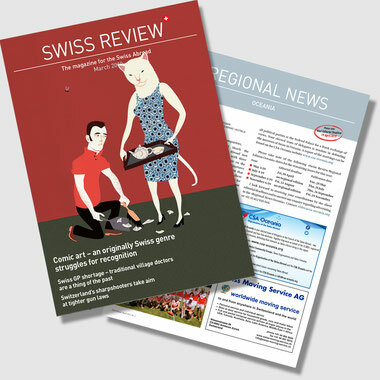 Details for Swiss Abroad will be available soon and communicated on the OSA website. There is hope that the deal with the Geneva Cantonal Bank will set an example for the whole sector according to OSA president Remo Gysin. He also said that the five major Swiss financial institutions were willing to boost cooperation with the OSA and the government, posting essential client information on the OSA and foreign ministry websites and appointing specialists for Swiss Abroad within their banks. All in all, the political pressure built up over time was beginning to pay dividend and some progress after years of deadlock has been made. “The end of the road hasn’t been reached yet” said OSA President Remo Gysin and Filippo Lombardi, OSA Vice-President and Member of the Federal Parliament for the canton of Ticino promised that new and amended motions would be launched in parliament if the overall situation does not improve for Swiss expat banking clients in the short future. Another motion is still pending in parliament. It’s asking Post Finance to review their offers to Swiss nationals living abroad. An account is currently possible at $25/months which is considered as too high. Background: In trying to comply with legal and regulatory demands after 2008 most Swiss Banks made Swiss Abroad to close their accounts or to pay considerable banking fees to compensate for additional expenditure. In a bid to end a ten-year battle, the OSA last September announced a strategy against the closures of accounts or high banking fees for Swiss expats. The OSA committee has held talks with representatives of five main Swiss banks since November to try and find a compromise. Voting recommendations by OSA board or CSA? A topic intensively discussed between both board and council members was the question whether the board should be able to issue voting recommendations or if this should be in the power of the CSA delegates. The board justified their recommendation for the “No Billag” initiative, saying there was no time to wait with a recommendation until the council meets. Due to different submissions from the delegates on how to handle this situation in the future further investigations will be made and presented at the next CSA meeting. Electronic voting has been a recurring topic at council meetings. Until three years ago, the OSA appeared to be on track with more than half the Swiss cantons offering e-voting. But in August 2015 the government blocked the use of one particular e-vote system due to flaws in guaranteeing voting secrecy. Two years later, in April 2017, the government gave the green light for two systems to be used. 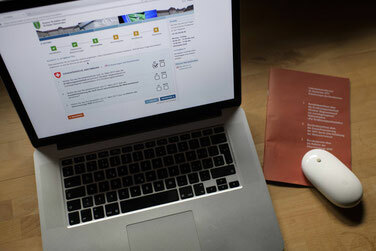 Currently Swiss expats from eight cantons are able to cast their vote online. Due to security issues being raised again several times in parliament over the last few months a debate pro and contra e-voting had been put on the meeting agenda. 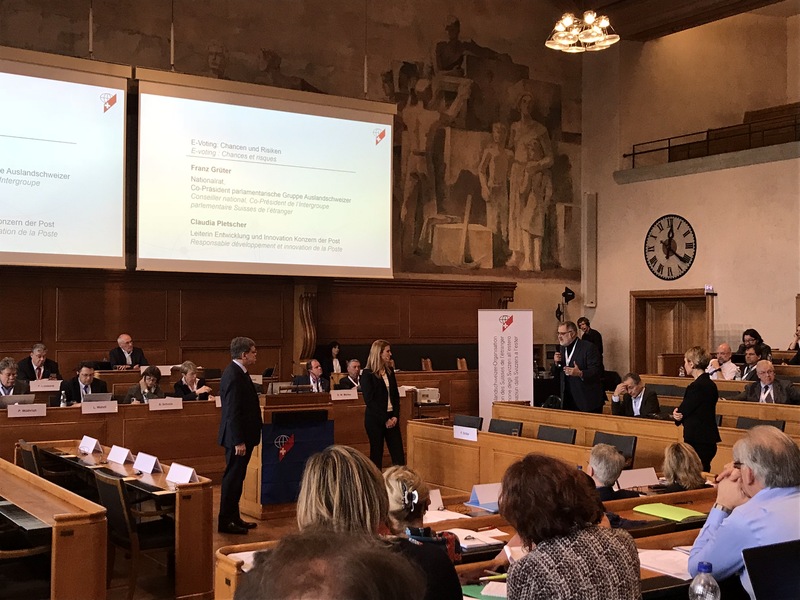 A lively discussion developed between People’s Party Parliamentarian Franz Grüter, a former IT businessman, and Claudia Pletscher, Head of development and innovation Swiss Post. Franz Grüter argued that the risks of cyberattacks were inevitable and would undermine the credibility of direct democratic tools, notably votes and elections. According to him “the question is not whether there will be an attack, but when the attack will happen”. Pletscher agreed that security and credibility are of utmost priority. She pointed out that no digital system is 100% secure. While the system used and developed by Swiss Post can potentially be hacked, there is a 100% control that these manipulations would not go unnoticed. In the event of fraud, the Electoral Commission would have to decide on the consequences, same as they would have to with invalid postal votes. 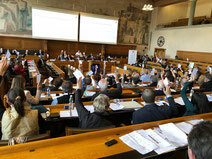 The delegates expressed a lively interest in the subject but seemed to agree in majority with proponents of e-voting. Support was also given by Federal MP and OSA committee member Carlo Sommaruga. He said that at this stage the majority of the parliament still seems to be in favour of continued efforts to introduce e-voting. He also pointed out that the first trials with e-voting were launched in 2004 in canton Geneva and hacking or manipulation had not been an issue to date. 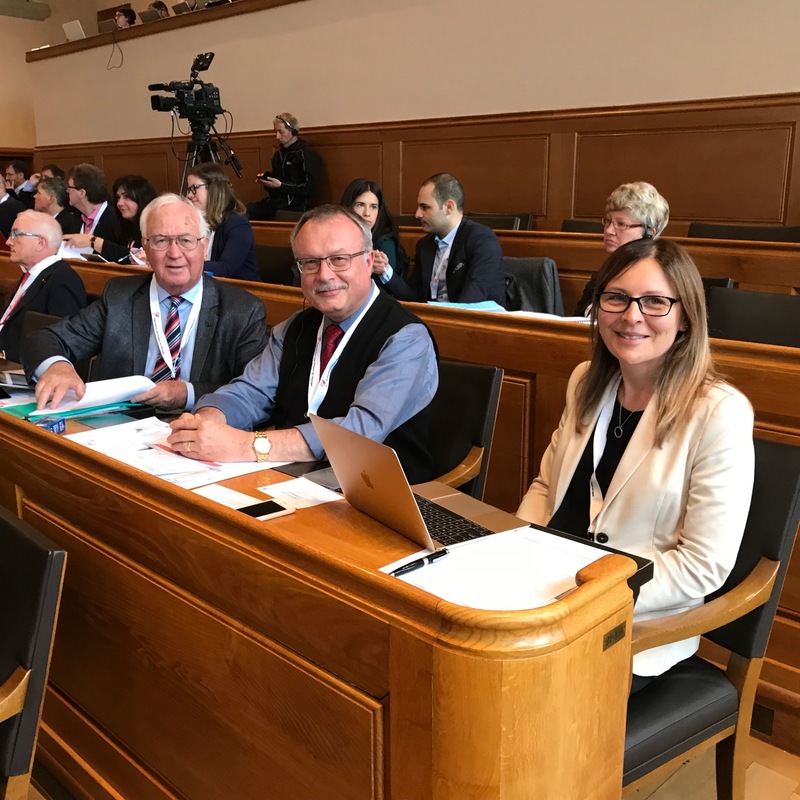 The OSA board reinforced their will to do everything possible for all Swiss expatriates to be able to elect members of the House of Representatives via e-voting in the next parliamentary elections in October 2019. Hans-Georg Bosch, South Africa, held a short presentation about the worldwide introduction of the automatic information exchange. Financial institutions pass on personal details of Swiss with residence abroad whereas tax authorities can access this information. Comment: As for the situation between Switzerland and Australia, information has been collected since 01.01.2017 and is being exchanged since 01.01.2018. A motion by delegates David Moerker and Max Haechler from the USA aimed at including English as official OSA language. A big debate developed, which clearly showed the two different views on this topic. Those voting in favour of the motion emphasised the importance of English as universal language for Swiss all over the world and specifically as common language in English speaking countries. Adding English would allow participation of young Swiss abroad who are 2nd or 3rd generation expatriates. Those speaking against were of the opinion that a delegate in the council needs to be able to speak and understand one of our national languages as only this would allow them to follow politics and current affairs in our country. The motion was dismissed by a majority. Comment: the wording of the motion may have been misleading as it is a condition for any council member to be fluent in either German or French, the official OSA languages. The aim was for English to be accepted as an additional OSA language to improve communication with a very large number of Swiss expatriates. As it happens, information distributed on the local communication channels of the Oceania delegates is translated/summarised in English by the delegates themselves. Franz Muheim, delegate from the UK and OSA board member, presented findings of his working group to increase representation of the OSA. 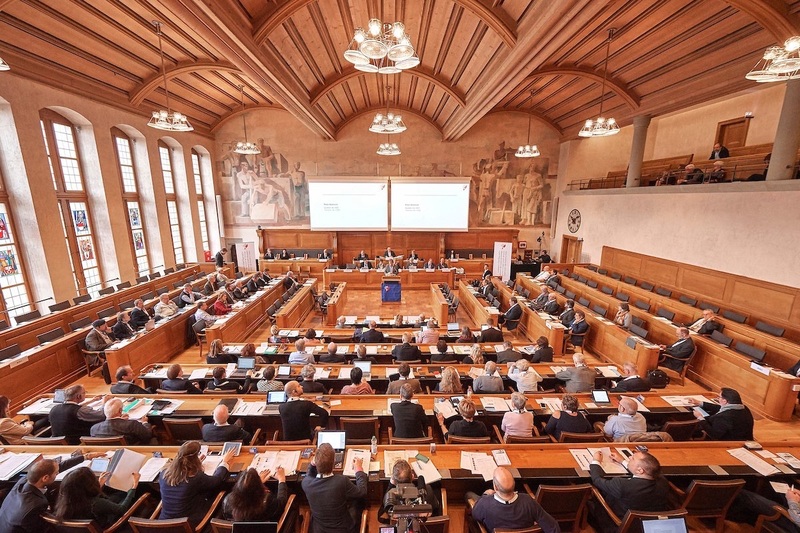 Topics investigated are inclusion of virtual groups such as Facebook Groups, the integration of the multiple existing communication channels into one platform, cooperation with the Department of Foreign Affairs and the goal to improve image of and goodwill for the Swiss Abroad. 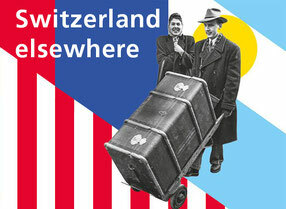 The next meeting of the CSA will take place in Visp, VS during the annual Congress of the Swiss Abroad. Please address your comments to any of the delegates.